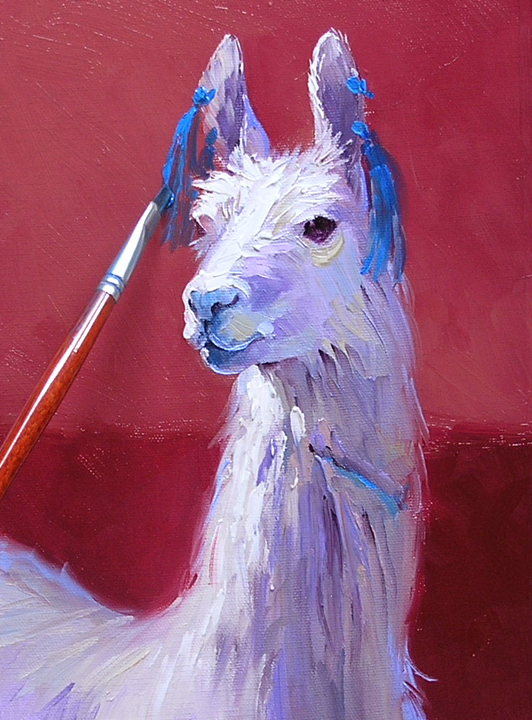 As a little girl I called llamas “Yippity Yamas”, thus the title of this piece! We are going to AUCTION this painting with a starting bid of 22 Cents. 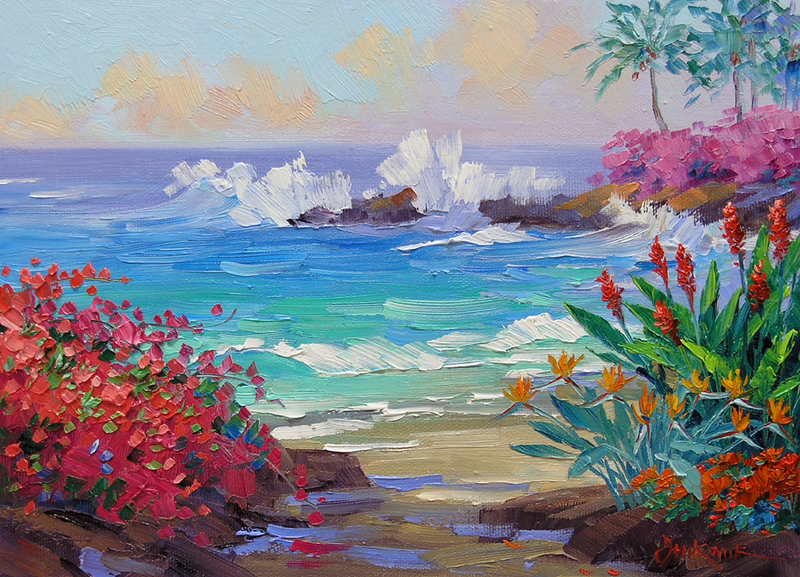 Please act quickly if you would like to add any of these paintings to your collection. We’ve had a lot of interest and already sold a few. 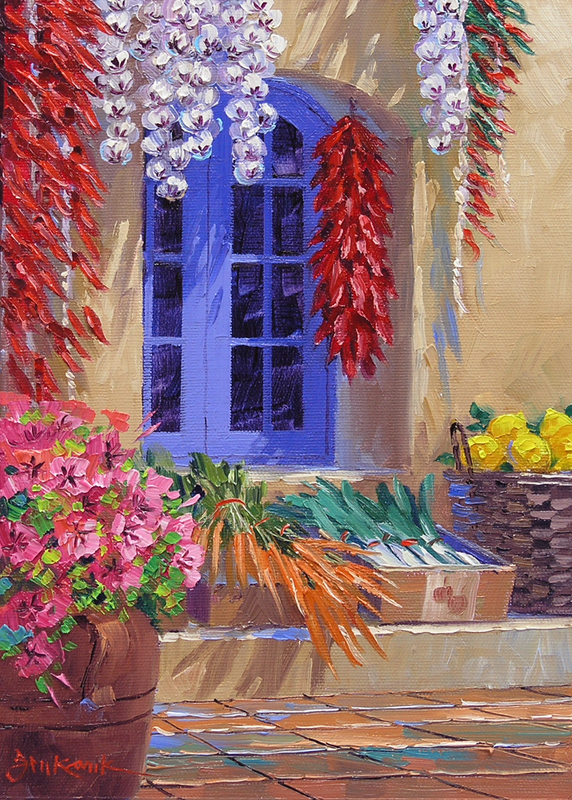 Just call Santa Fe Art Collector Gallery at 505.988.5545 or email info@santafeartcollector.com. 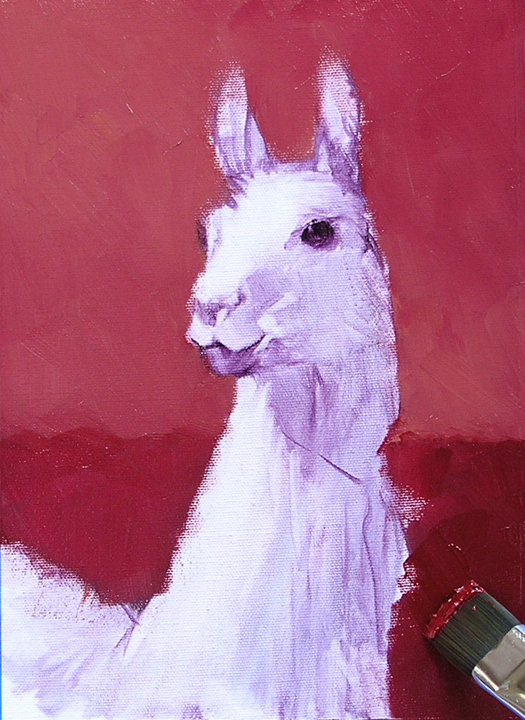 I love Llamas! We’ve never been to Peru but have taken and collected many pictures of these delightful creatures over the years. I just had to include one in our TRAVELS event. 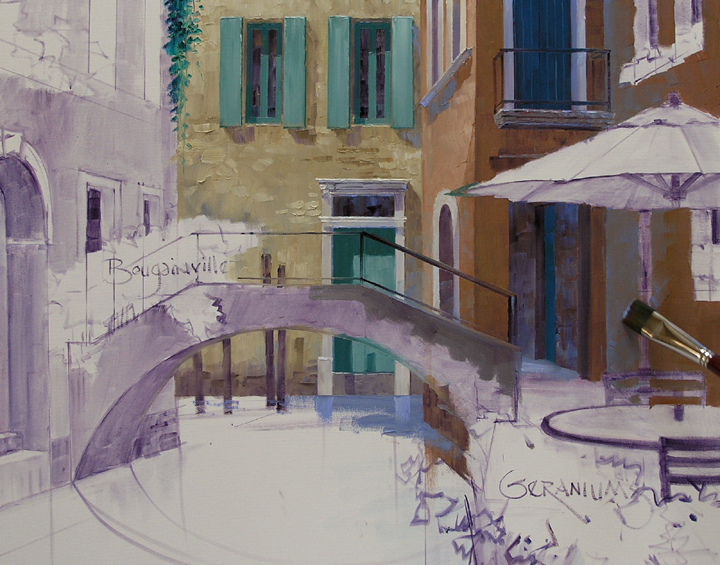 The background is made a two tone muted red to replicate an old stucco building. 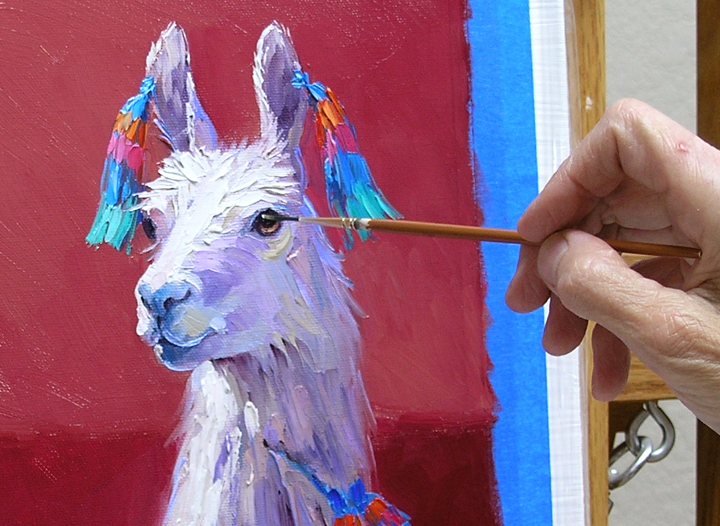 The dark value will accent the sunlit highlights on the Llama. 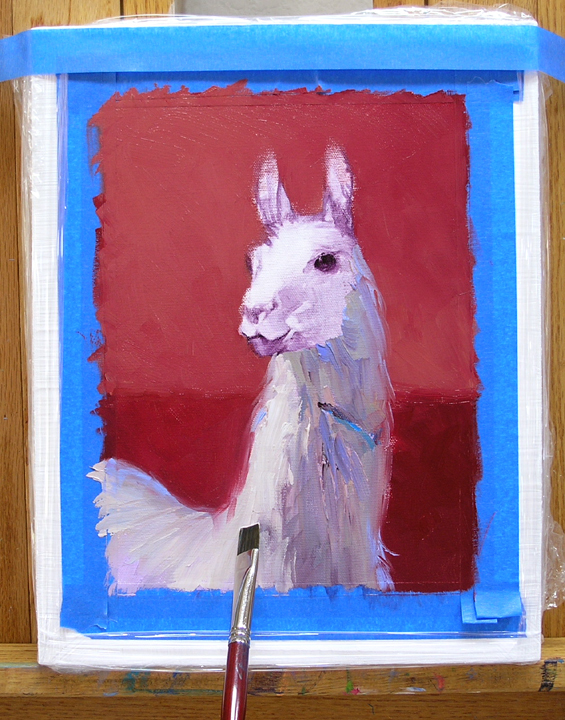 Much like painting a white horse the body of the Llama is blocked in with various shades of MUD (Ultramarine Blue + Alizarin Crimson) + a bit of Cadmium Orange + White. 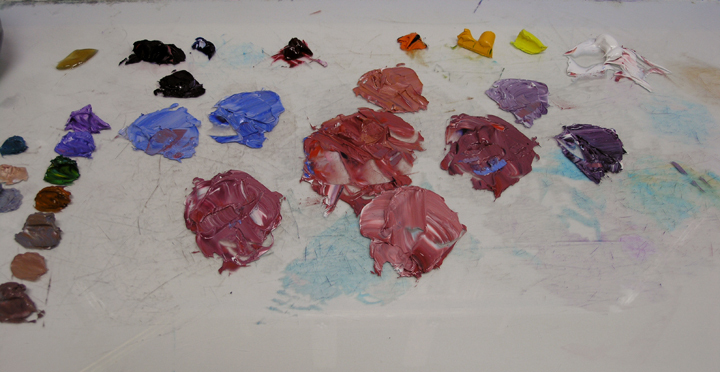 Mixes of Ultramarine Blue + Cadmium Orange + White are also used. I want the shadow areas to be dark enough so the White highlights POP! The sunlit portions are painted with lighter values of the above mixtures. 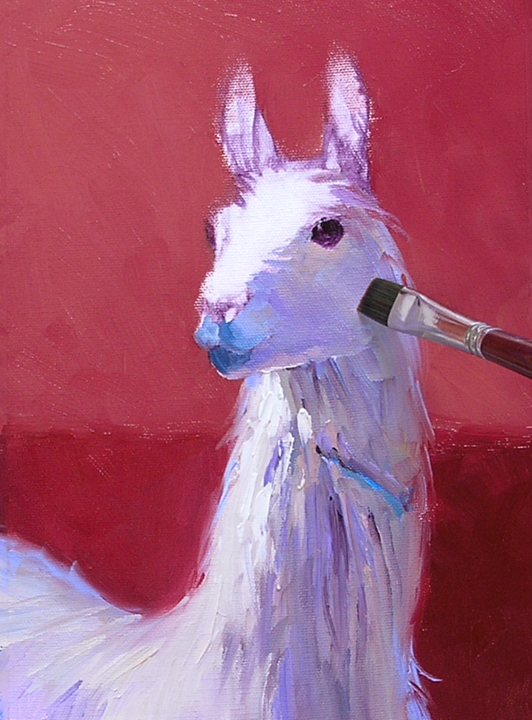 Pure White is reserved for the highlights on the head. 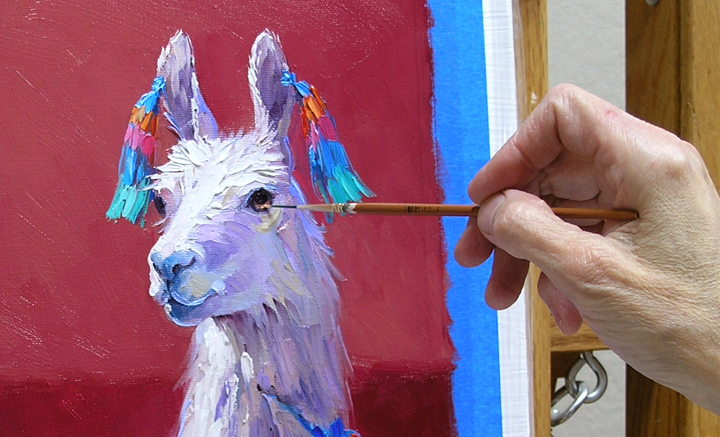 Moving to the head of the Llama the basic shadows are also painted. 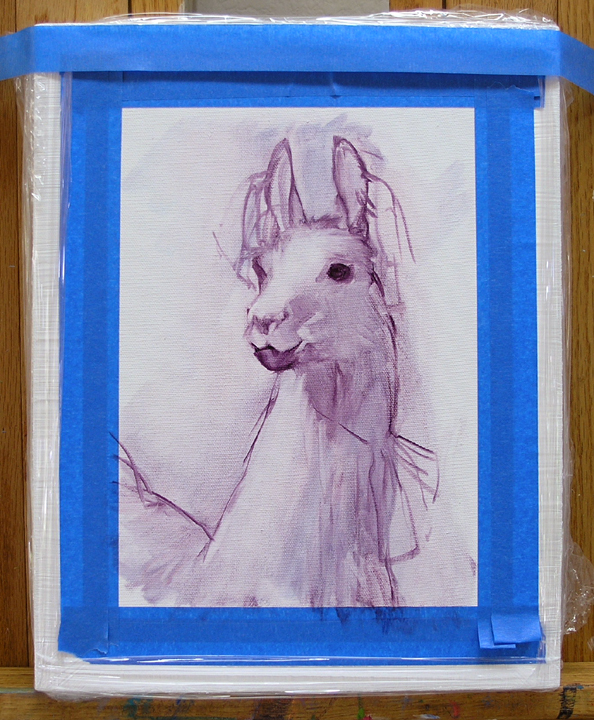 The gray muzzle is made of Alizarin Crimson + Phtalo Blue + White. The pure White highlights on this guy’s face make him stand out from the background. 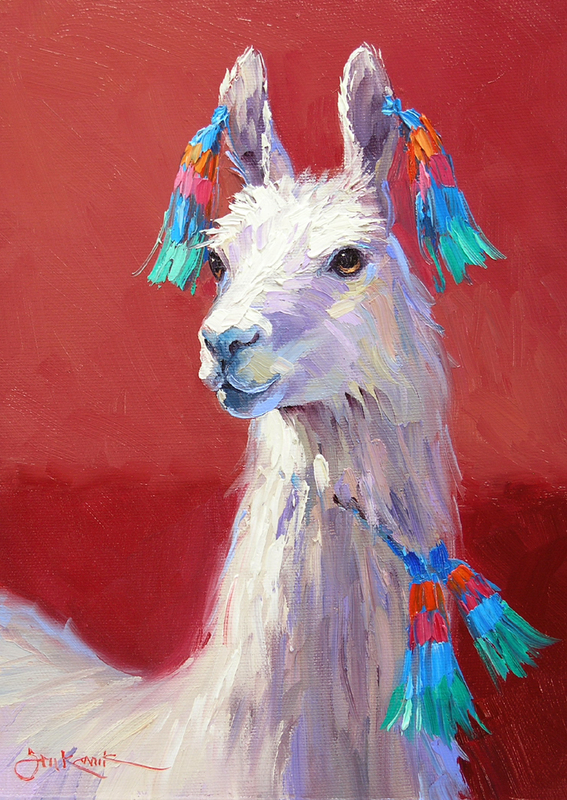 We think the way Peruvian’s decorate their Llamas with tassels is so cool. They look as if they are ready to go to a party! Now for the “Jack White” eye. The entire dark area of the eye is painted first with MUD + Liquin. Then I make a thin crescent of Burnt Sienna (MUD + Cadmium Orange + Cadmium Red Light + White) along the lower curve of the eye. The center of the crescent is made a little lighter. Then a tiny white catch light is added just under the upper lid. Since the light is coming from the upper left the catch light is placed at 11 o’clock. The lightest part of the crescent on the other side of the eye is at 5 o’clock. This is because the sunlight from above hits the top part of the eye then is transmitted through the clear cornea to illuminate the iris on the other side. This same “Jack White” eye technique works for people and any kind of animal. Please remember, don’t put the catch light in the middle of the pupil, your subject will appear to be drugged. 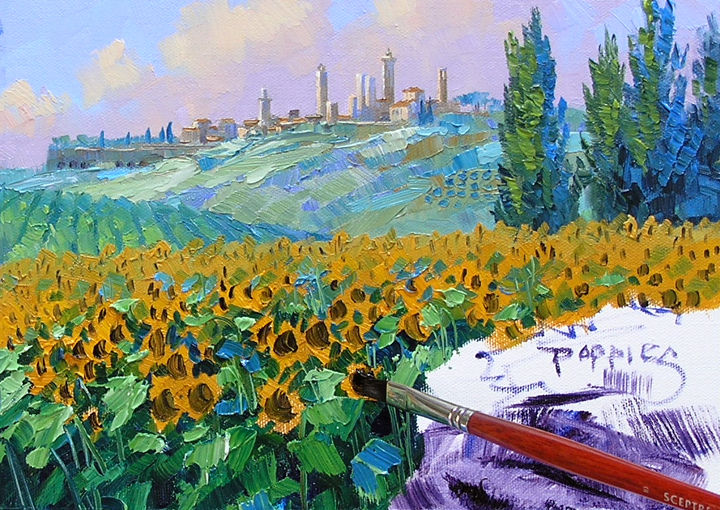 As we traveled through the rolling countryside of Tuscany Jack and I were totally entranced. My sharpie pen literally flew across the white pages of my sketchbook recording vignettes of the trip. Suddenly in the distance the towers of San Gimignano appeared. My heart stopped for a moment as I drank in my first view of the ancient city. Sun warmed clouds float softly in the summer sky. 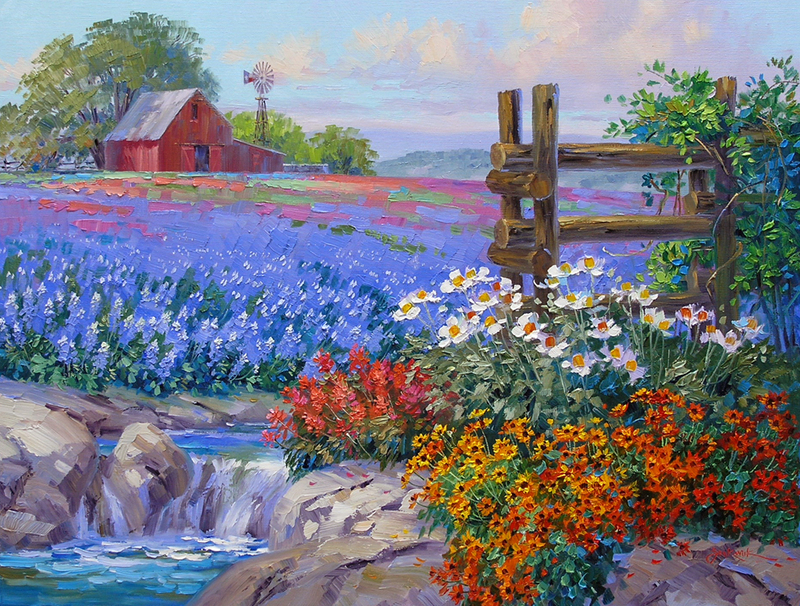 The distant hills are painted with cool greens made of various mixes of Pthalo Blue + Cadmium Orange + White. It’s amazing the range of color you can get with this combination. 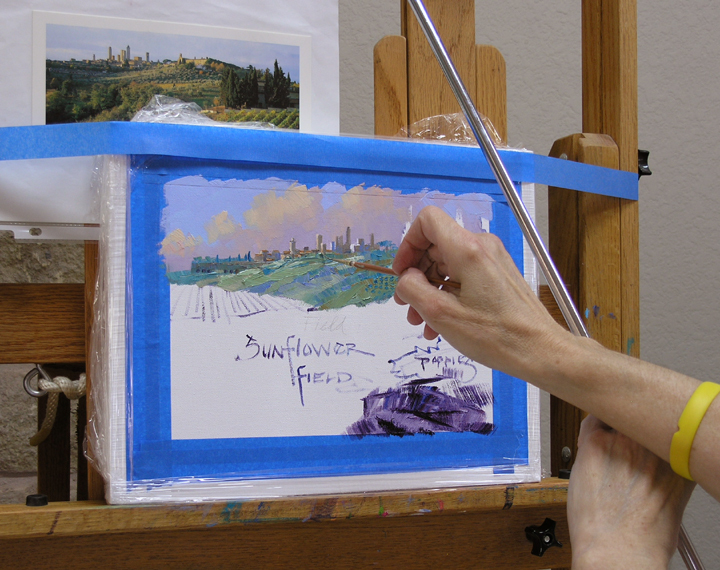 Using the mahl stick for support I delineate the details of the distant buildings. 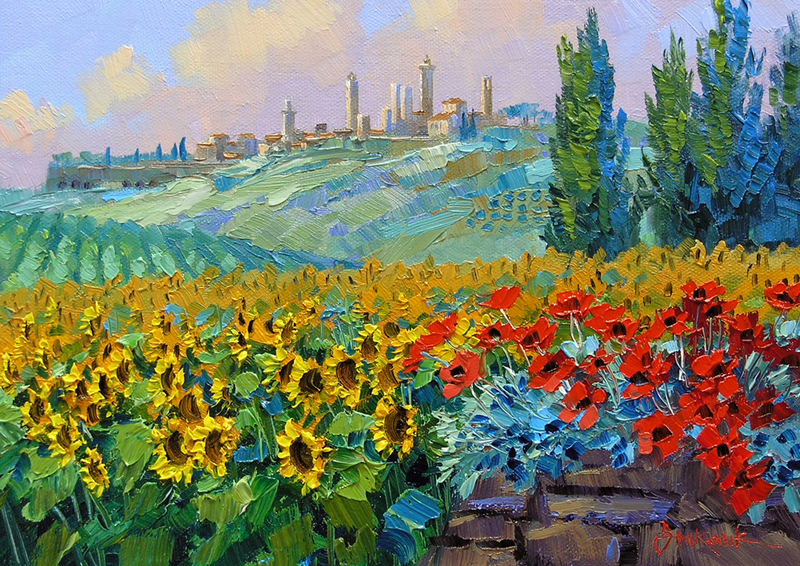 I decide to fill the foreground with Sunflowers, one of the signatures of the Tuscan landscape in the summer. The broad field of yellow is painted first, followed by the leaves. Adding the dark centers brings these delightful flowers to life. 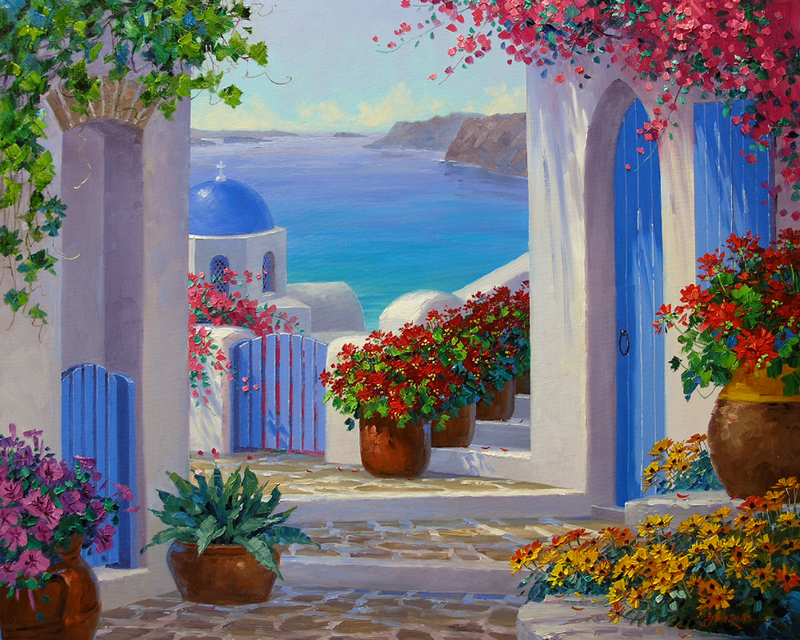 We are going back to the Greek Islands today. 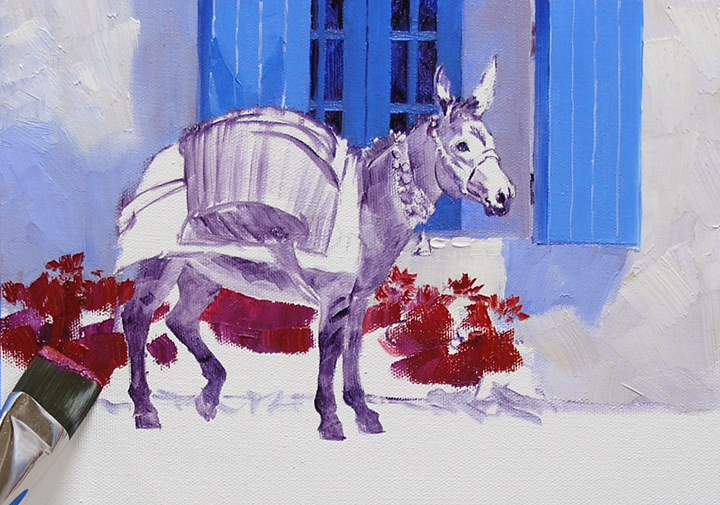 I love the burros that are used for transportation and to haul just about everything. 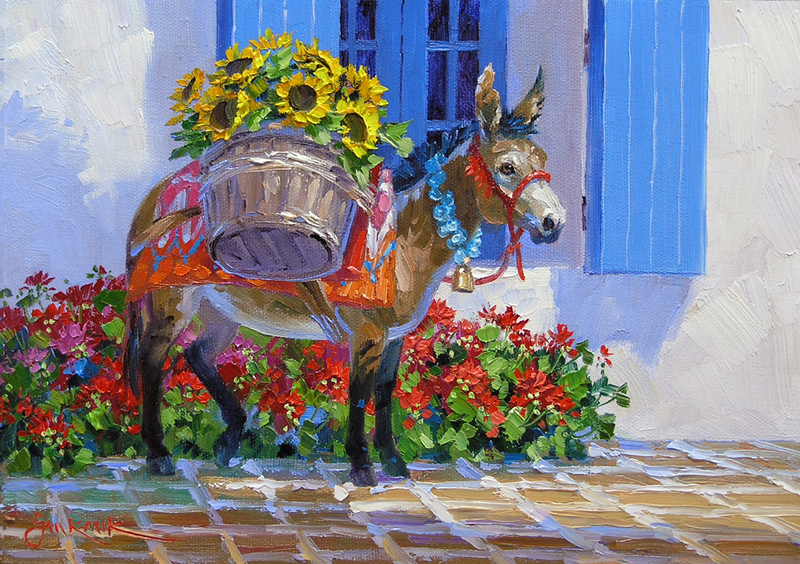 Especially beautiful are the little donkeys loaded with flowers, just perfect to paint for our Collector Event. Every year I try to do some small pieces for our show in Santa Fe. These are a lot of fun to do and they are very popular with our collectors. During the Event we have a drawing giving our collectors the opportunity to purchase the little gems. The whitewashed building with Cobalt Blue window and shutters is painted first. 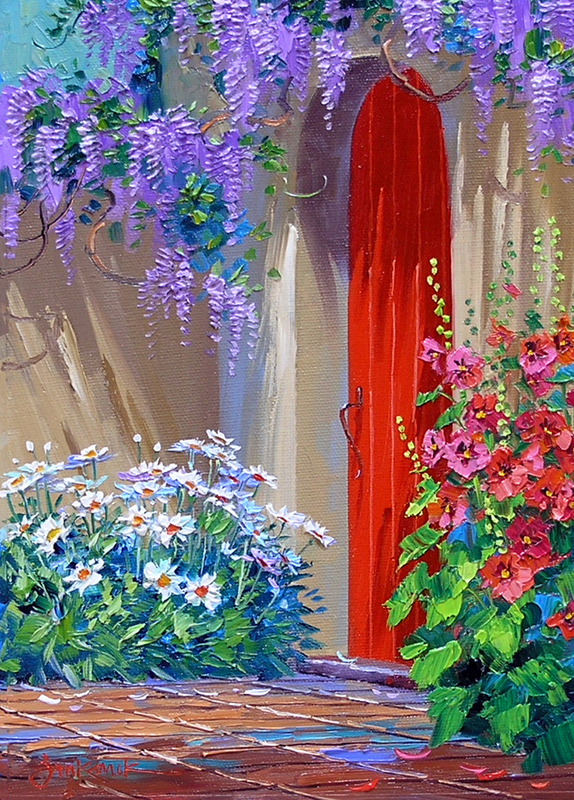 Then the blossoms of the Geraniums are blocked in with mixes of Cadmium Red Deep + Magenta and Cadmium Red Deep + Cadmium Red Light. To enlarge any of these pictures just click on the image. 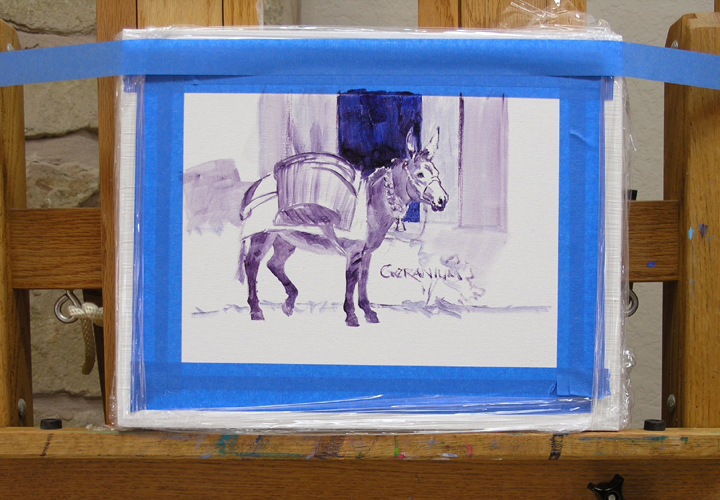 After completing the Geraniums and floor I begin to block in the burro. 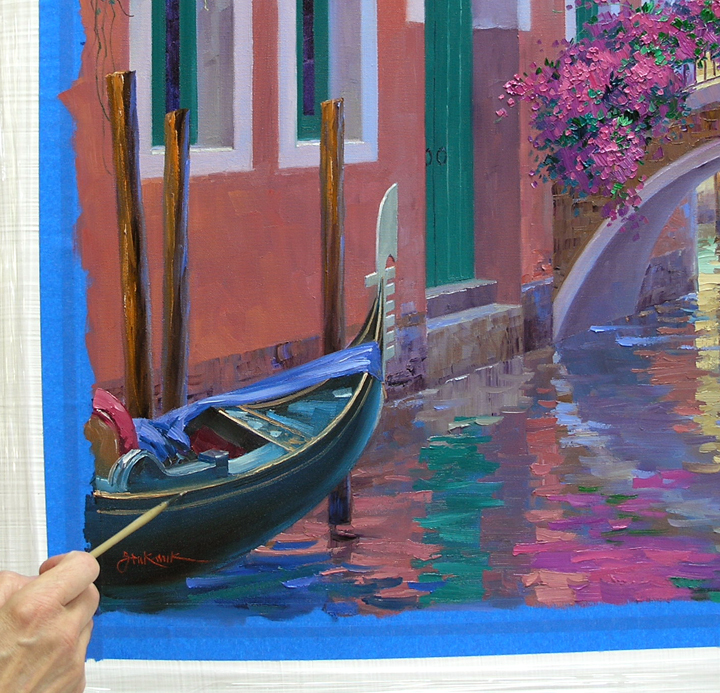 Various mixtures of Cadmium Orange + MUD (Ultramarine Blue + Alizarin Crimson) + Ultramarine Blue + White make the basic browns of the body. 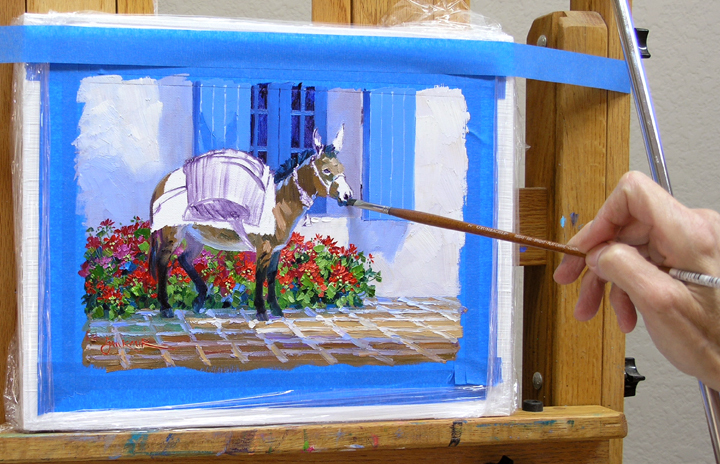 The black for the mane, tail and legs is mixed with Alizarin Crimson + Pthalo Blue. Some of the cool shadow color from the building is used for the white belly. 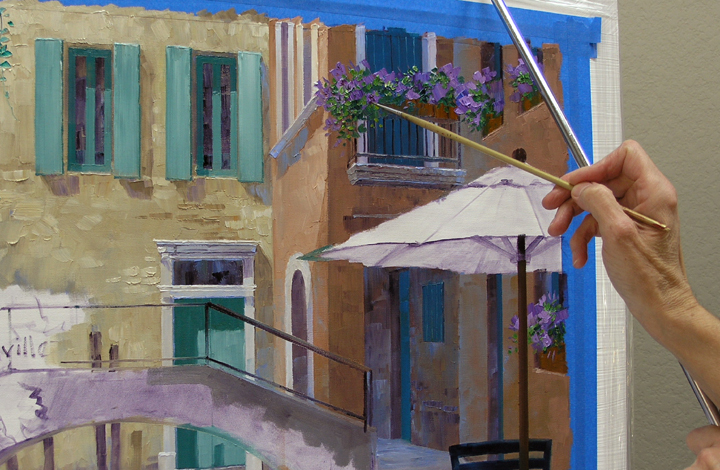 I brace my wrist on the mahl stick to steady my hand as I paint the detail. We have the nicest readers. 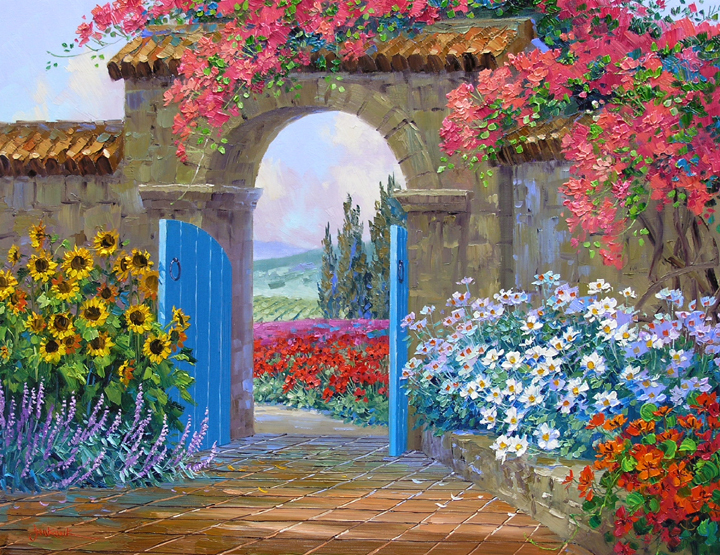 A heartfelt “Thanks” to all of you for your wonderful and kind comments. We so appreciate you and your support. Let’s plant some flowers to embrace the little outdoor cafe table. 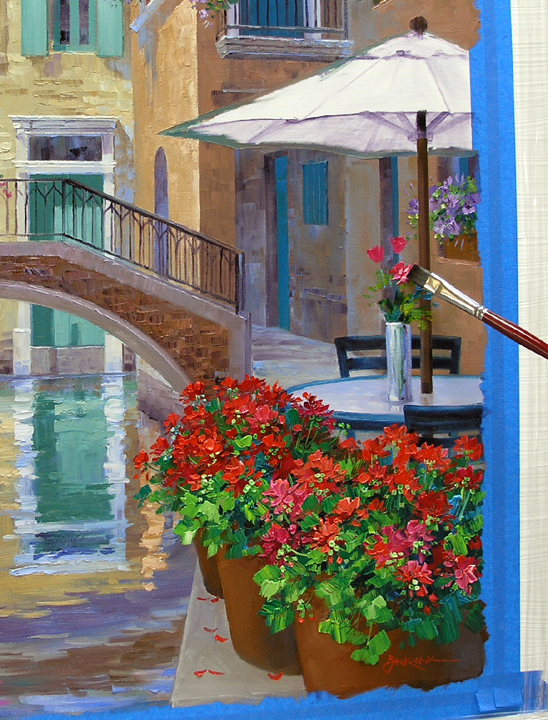 Geraniums, some of my favorites, are seen everywhere in Venice so we’ll fill the containers with them. The colorful blossoms are blocked in first, followed by the leaves. Remember, you can enlarge any of these pictures by clicking on the image. Jack suggested the bud vase on the table filled with fresh pink roses. Isn’t he so romantic? 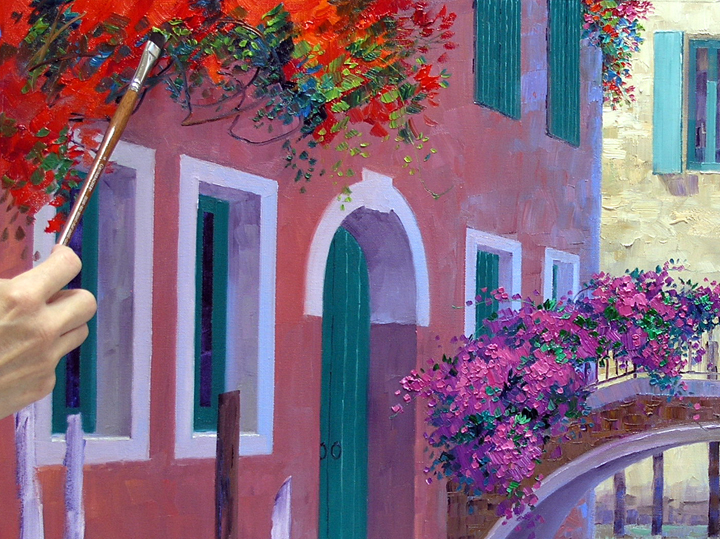 And…… I’m sure you noticed I had signed the painting yesterday at the bottom of the gondola. NO, I’ve not signed it twice. We felt the signature was distracting to the shape of the boat so I painted it out and resigned the painting here. 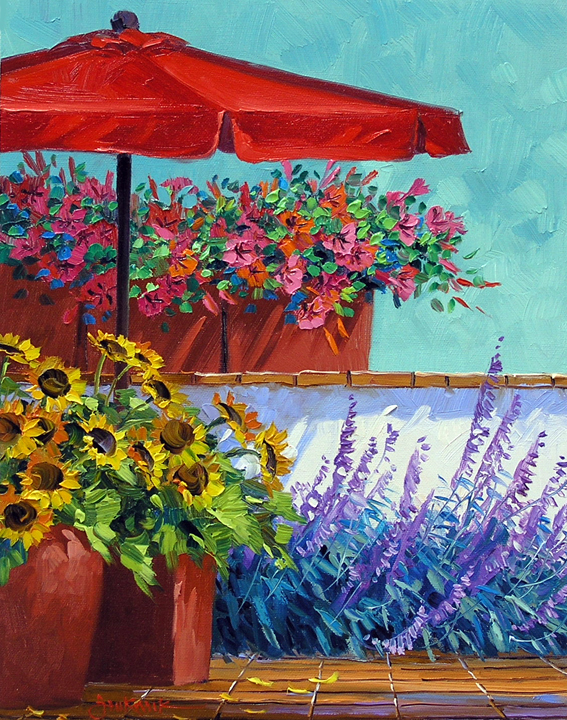 The umbrella is painted with various mixes of Cobalt Blue + a tiny bit of Pthalo Blue + White. The blue of the ‘brella appears even more intense with the sienna, or basically orange, building behind it. This is because blue and orange are complimentary colors or across the color wheel from each other. Placing them close together makes the umbrella look brighter. 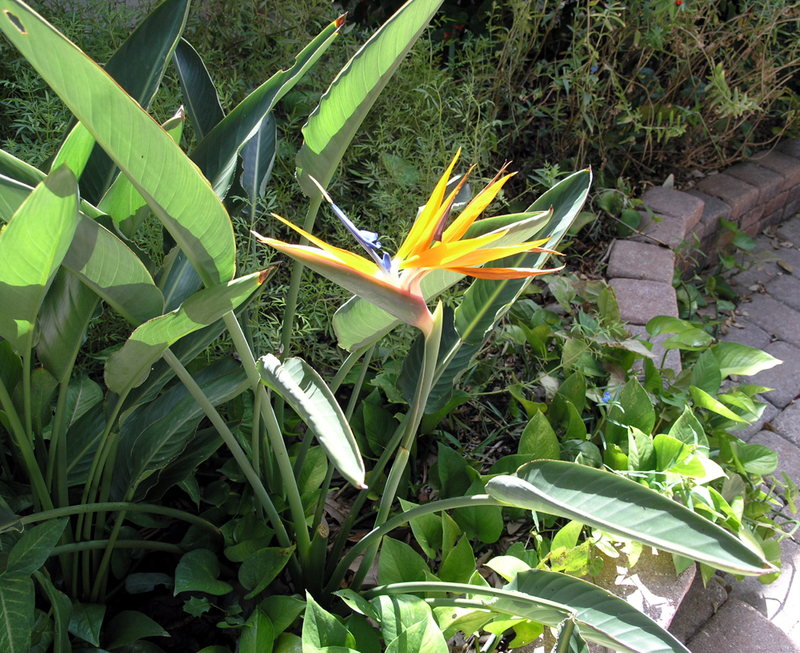 First I have to tell you our Bird of Paradise bloomed! What a neat surprise. I’m sure you are thinking to yourself, “Well, isn’t that what they are supposed to do?” We thought that also when we planted it 5 years ago, but this is the first time it has rewarded us with its beautiful bird like flower. So I just had to share our garden surprise with you. 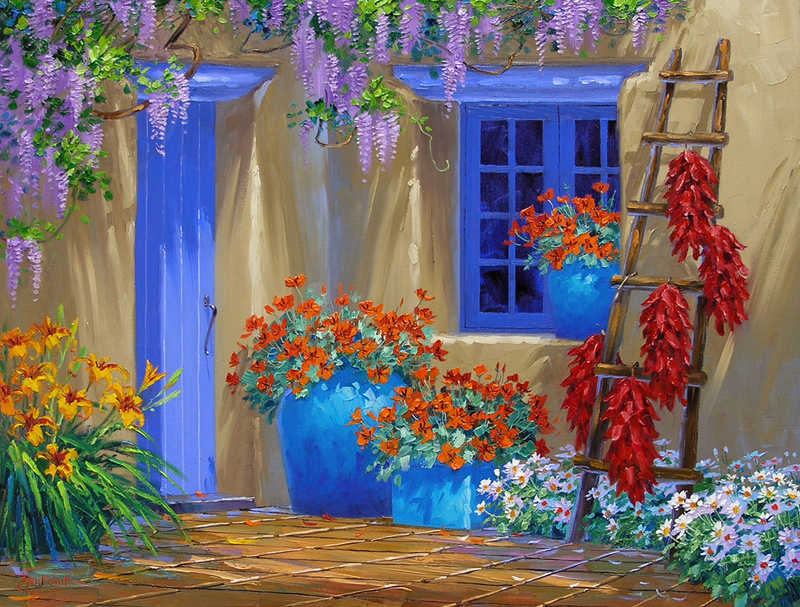 Let’s do some planting at the easel. Orange Jubilee vine cascades down the faded red wall, adding a burst of vibrant color. 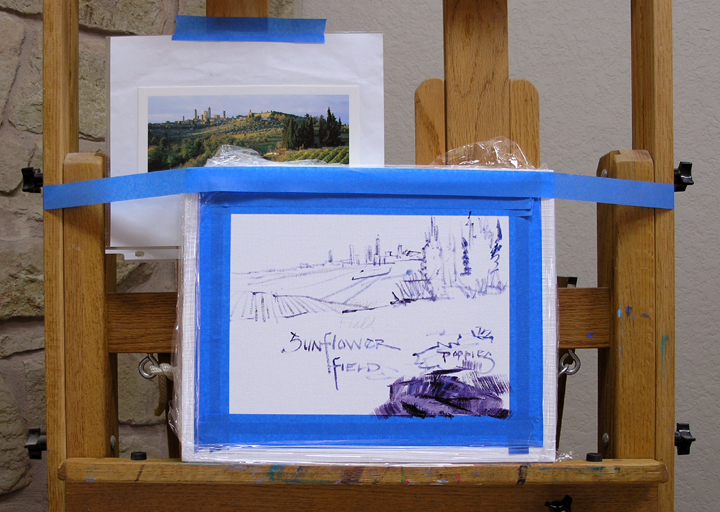 After examining the painting in the mirror placed behind my easel I decide to lower the tops of the distant windows. Another good reason to have saved all that paint. 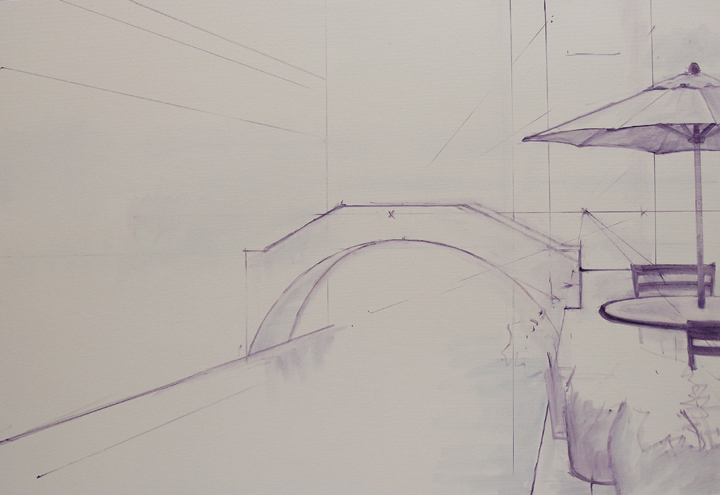 This makes the building at the end of the canal drop further back, giving the piece more depth. Ah, now to the gondola. 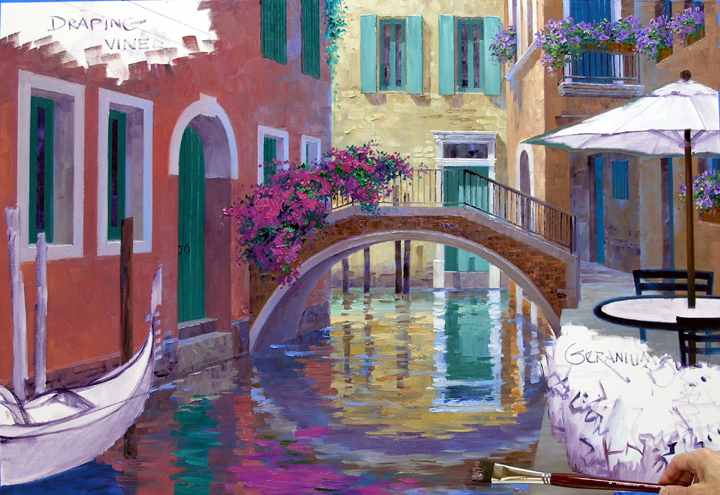 Gliding through the canals of Venice in one is so totally unique and romantic. 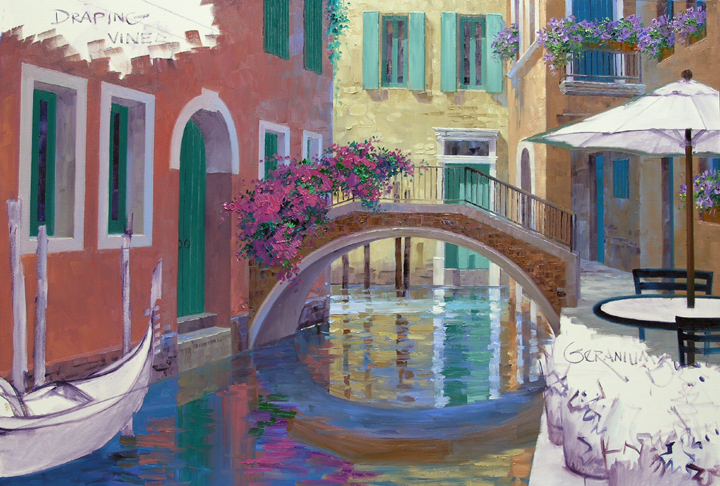 A painting of Venice just doesn’t seem complete without a gondola. The ferro, on the front of the bow, has become a symbol of Venice. The S form imitates the winding of the Grand Canal and the six teeth represent the six districts into which Venice is divided. The semi-circular break between the curved top and the six teeth is said to represent the Rialto Bridge. 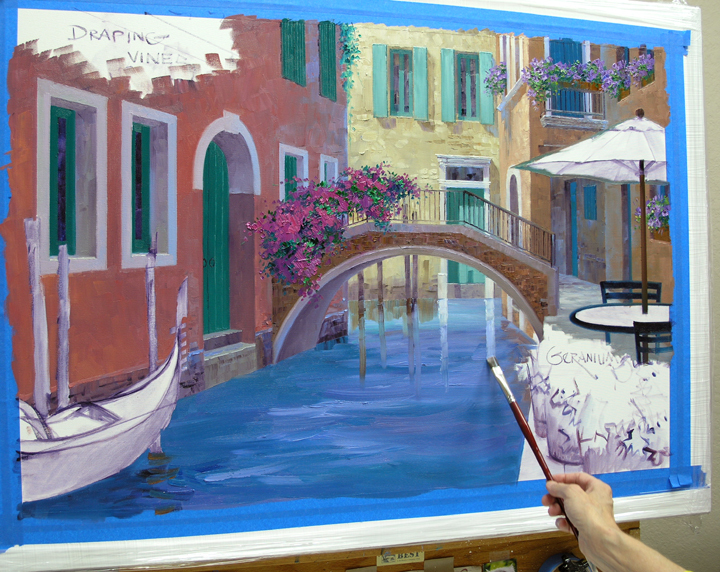 The basic blues of the water are painted first. The most distant part of the canal is in the sunlight; the rest of the water remains in shadow. 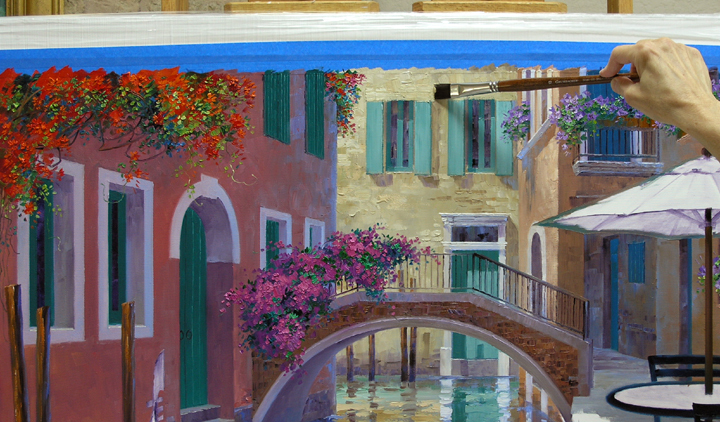 Reflections are pulled, straight down into the wet paint of the water. 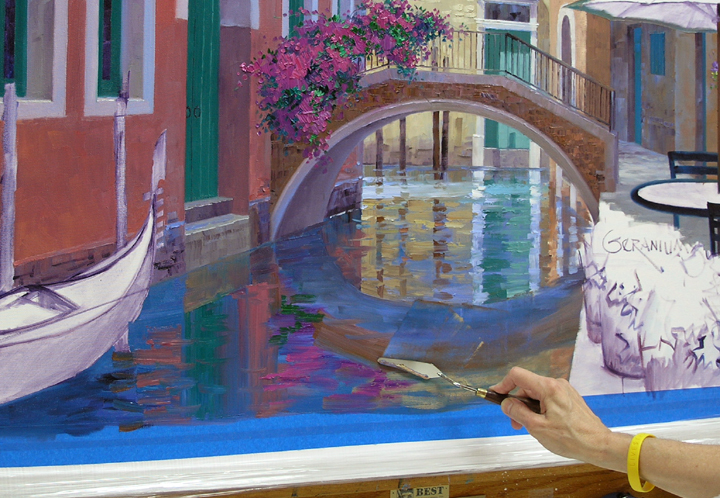 Here is where all of that leftover color comes in handy, I don’t have to mix more paint for the reflections. Strokes of the building and door colors are pulled horizontally to indicate the ripples in the water. The foreground canal is now blocked in. OPPS! I don’t have the reflection of the arched bridge correct. 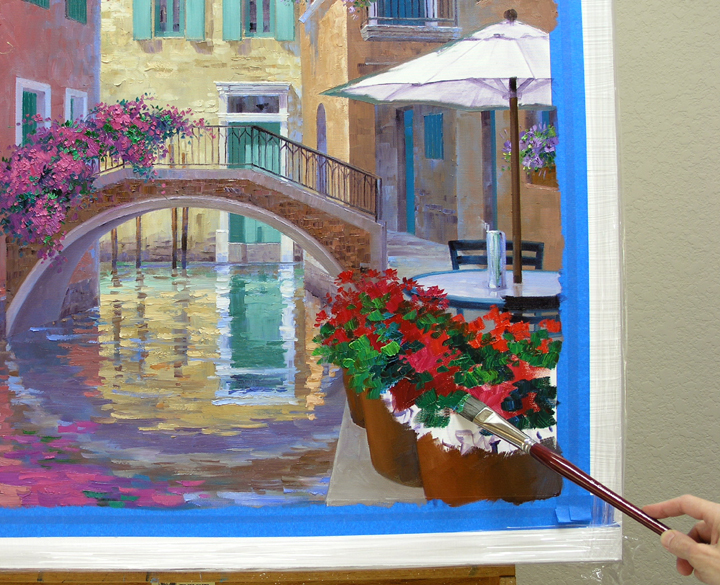 SO…….I take my painting knife and scrape all of the paint off the canvas in the foreground and start over. 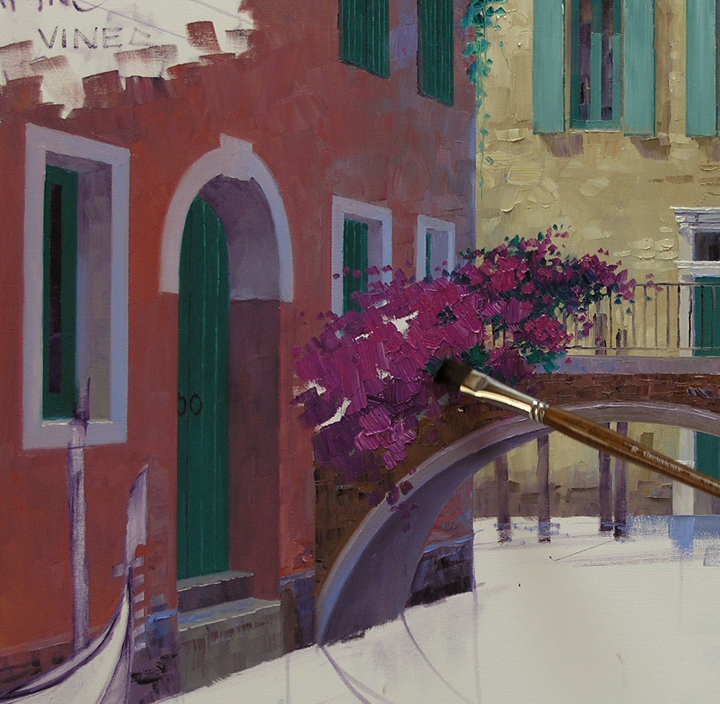 This is one of the things I love about oil paint. If you don’t like what you’ve done you can scrape it all off and begin again! There, don’t you think that looks better? 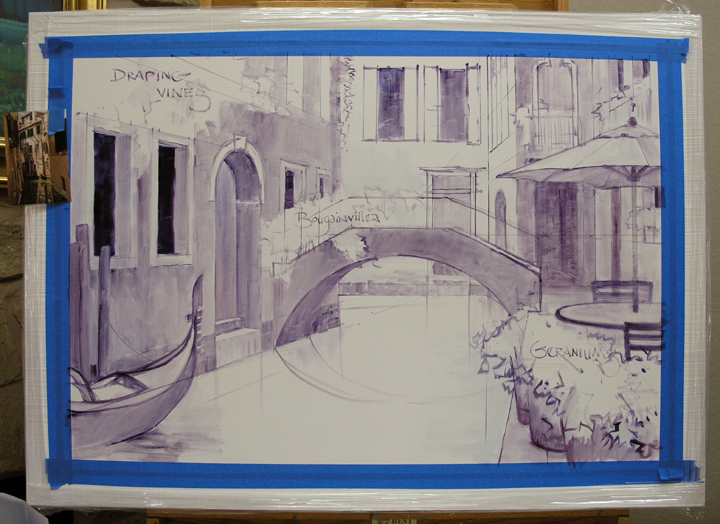 I still have to work on the reflections of the gondola and mooring post but that will be done when I paint the boat. The piece is really changing now the water is complete. 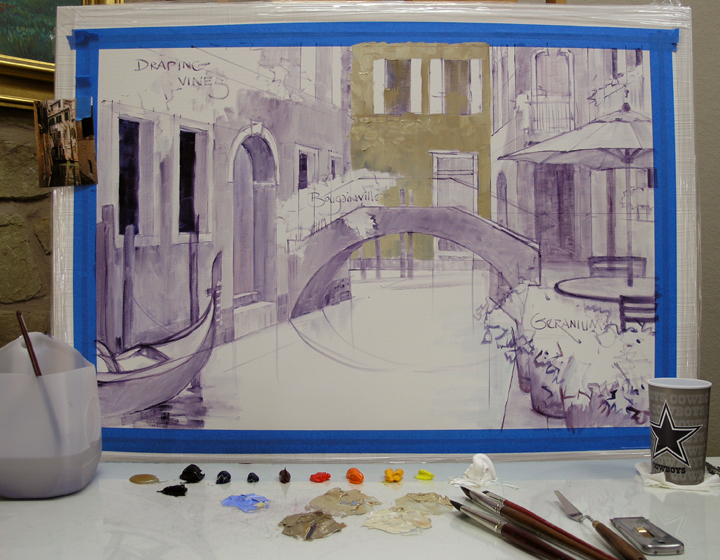 I’m so excited about how this is turning out, Venice is so much fun to paint. For the building in the left foreground I make mixtures of various proportions of Alizarin Crimson + Cadmium Red Light + MUD + White. 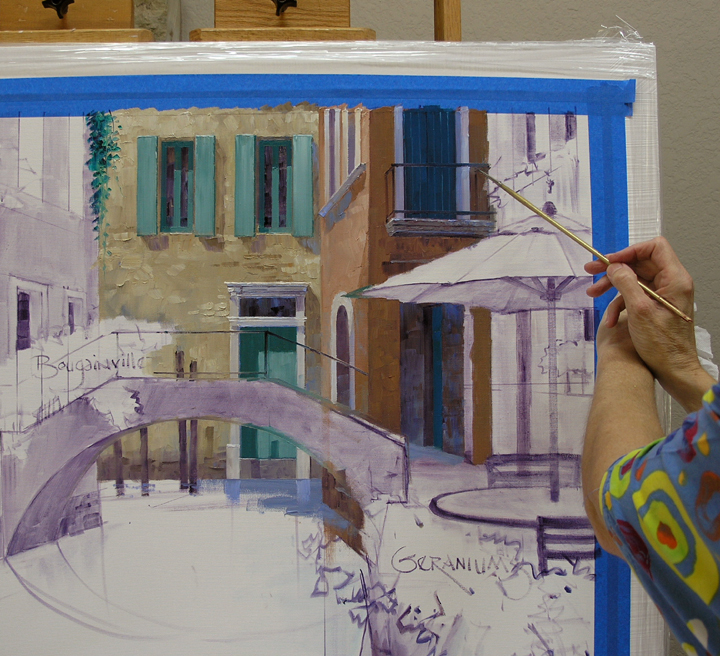 A couple of shades of Ultramarine Blue + White are also mixed. The entire surface of the wall is covered, the distant part is bluer, or cooler, so it will fall back. The area underneath where the vines will drape down is made darker. The darkness of the arched bridge accentuates the sunlit building beyond. 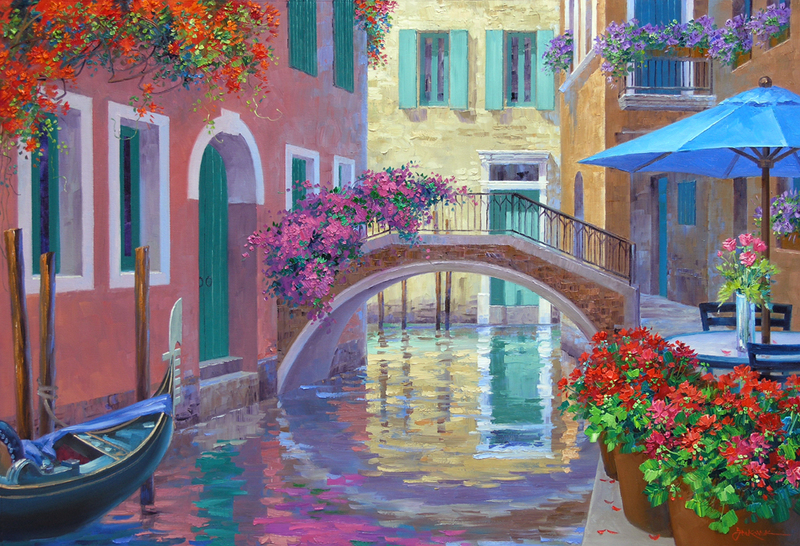 My basic plan is that the dark buildings and water in the foreground will act like a tunnel directing the viewer’s eye to the light at the end. 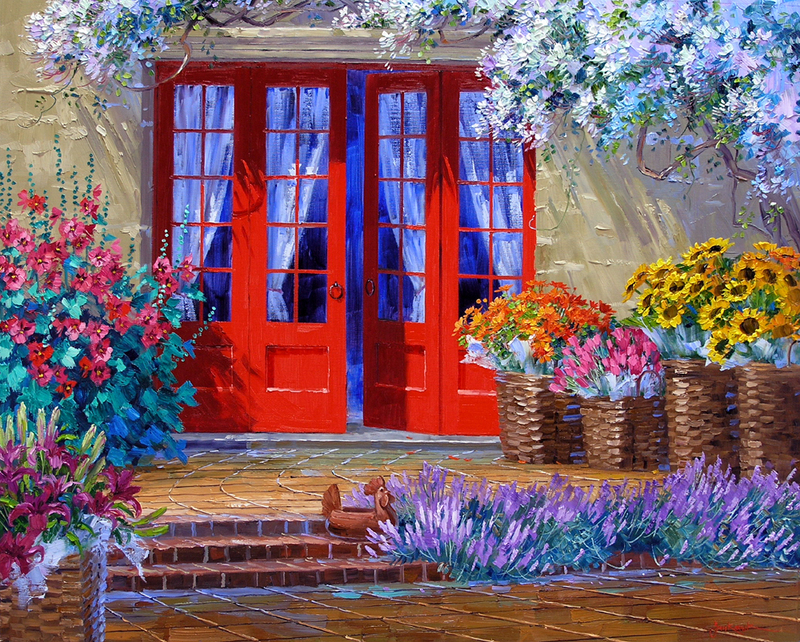 The doors, windows and shutters are Viridian Green + Alizarin Crimson + White. 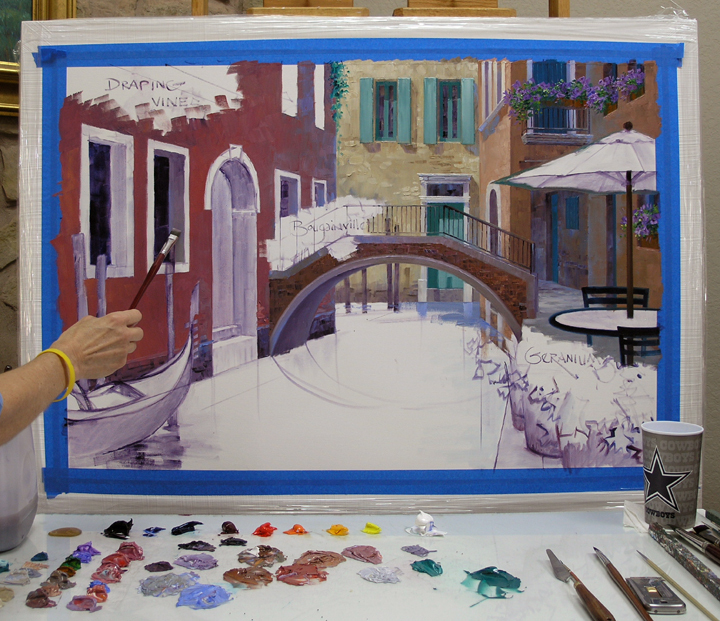 The white borders around the windows are made cooler in the distance and warmer in the front helping to give the feeling of depth in the painting. The upright plane of the steps is darker while the flat top is lighter because it receives more illumination from the sky. Well, I just have to make the buildings successively warmer as they come closer to the front. 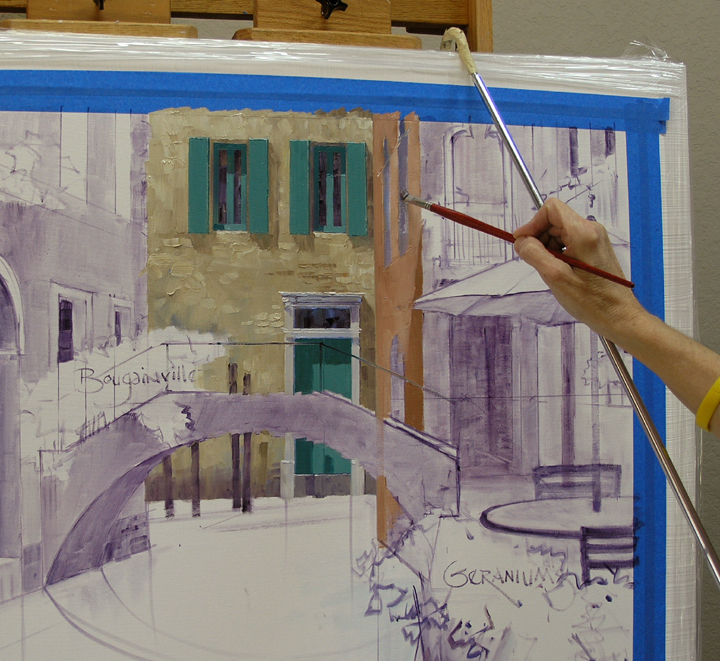 The next one we work on is a muted Sienna made of Cadmium Orange + Cadmium Red Light + MUD + White. 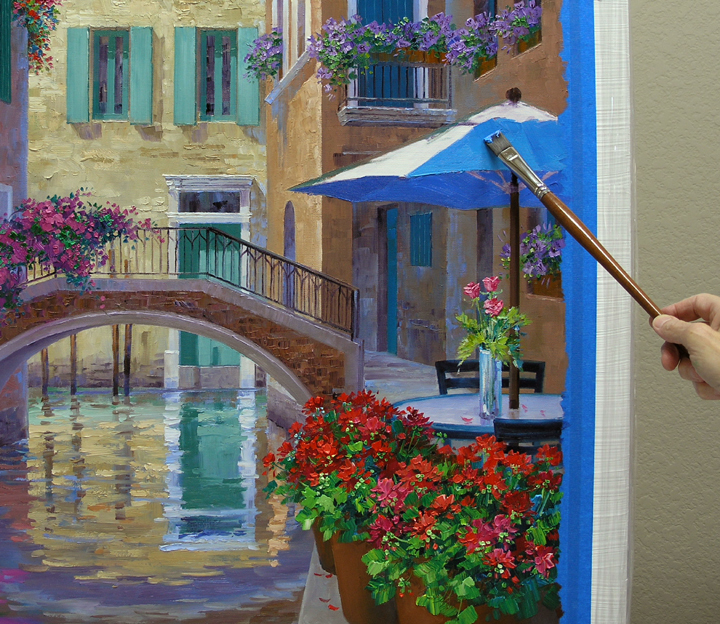 I steady my hand against a mahl stick hooked over the top of my canvas to paint the details. 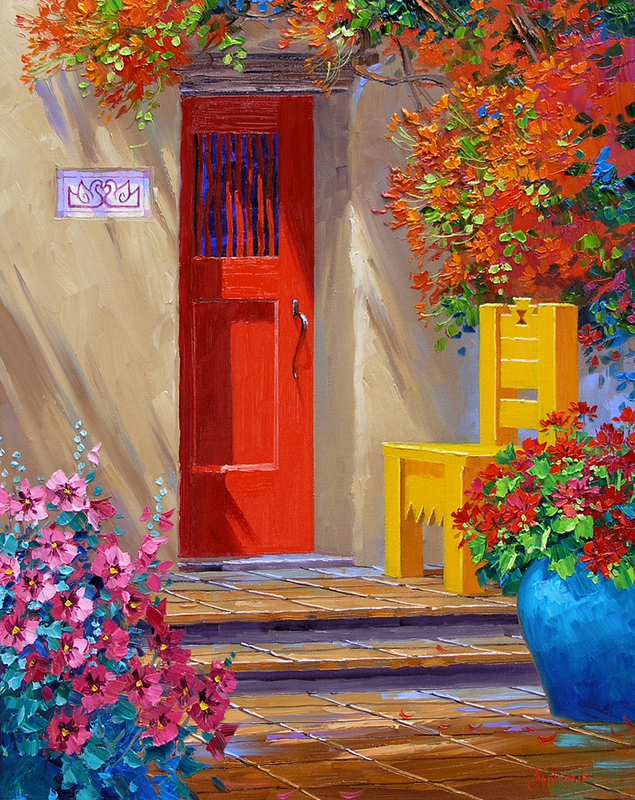 The doors and windows of the building on the right are made of Pthalo Blue + Cadmium Orange. This makes a nice rich Blue-Green that goes well with the Sienna colored walls. The railing of the balcony is drawn directly over the wet paint of the door and wall. 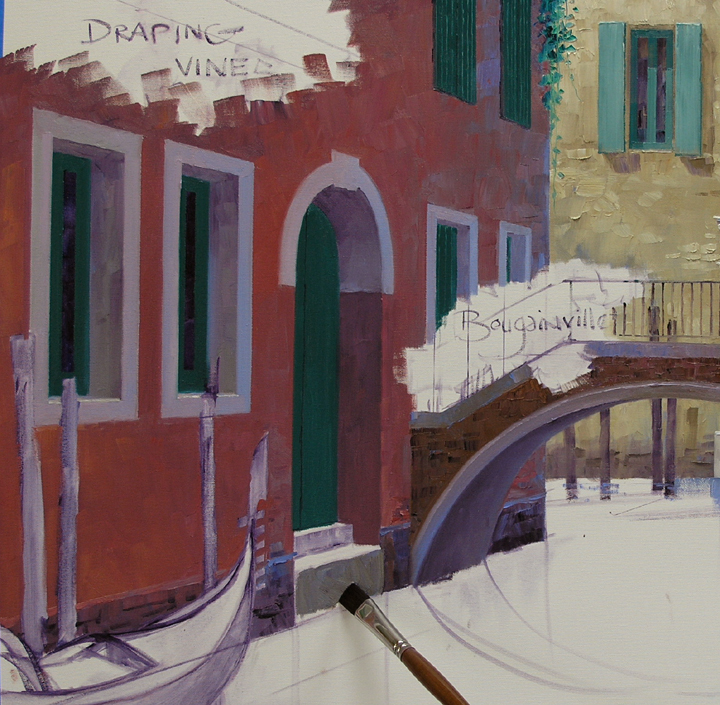 To make the wall of the building on the right appear to project forward a mix of Ultramarine Blue + White is dragged over the distant portion that was previously painted with the Sienna color. This makes the back part of the wall cooler and the front part warmer. 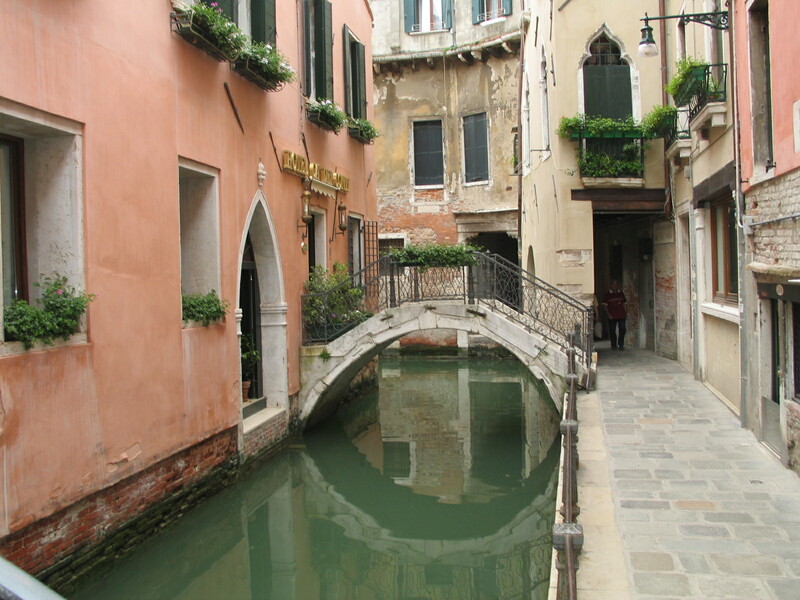 You’ve most likely heard me say this before but here goes again, “Venice is one of the most romantic places in the world.” We love all of the hidden canals you can wander alongside or float down in a gondola. In the early evening after the hustle and bustle of the day has calmed down you feel as if you’ve stepped back in time. The picture I’m using for reference was taken by dear friends of ours, Jennifer Young and Dave Webb. 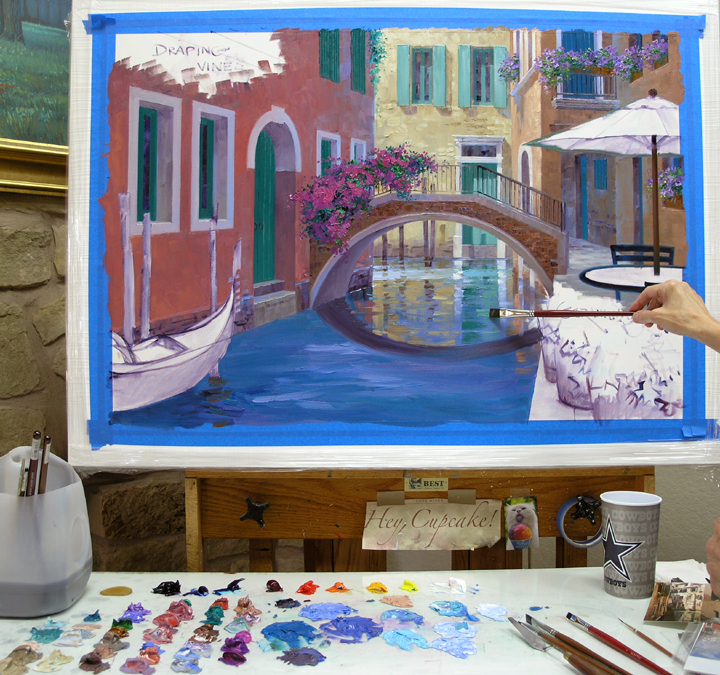 Jennifer is a wonderful artist and shared the photos they took on their last trip to Venice. 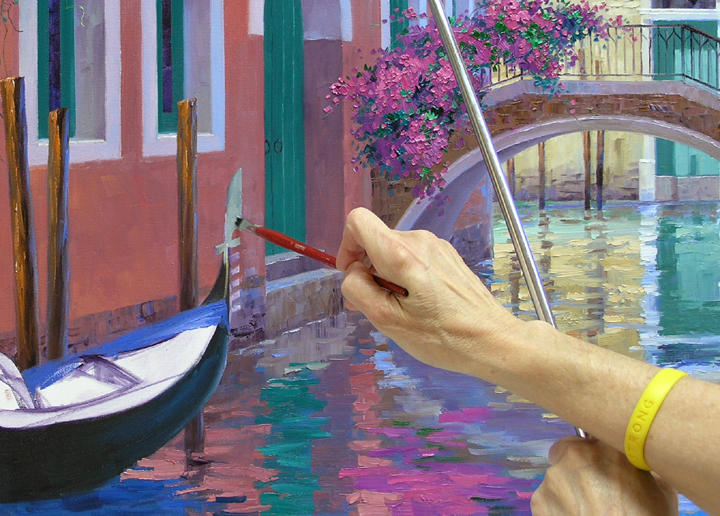 CLICK HERE to see her paintings. We love Dave too, even if he is a Redskins fan. GO COWBOYS! 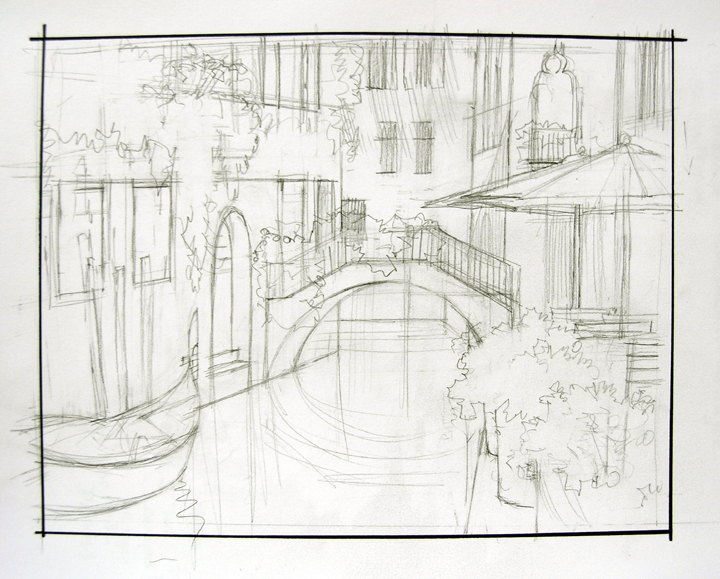 I make a pencil sketch to get my ideas down. The proportions are not exactly right in the drawing, I’ll make those corrections on the canvas. 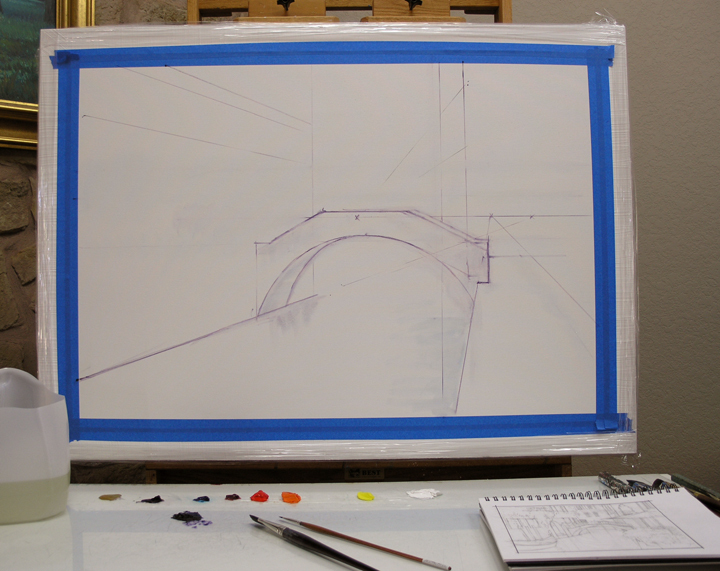 The first step in drawing the scene on canvas is to establish the horizon line and vanishing points for the buildings. 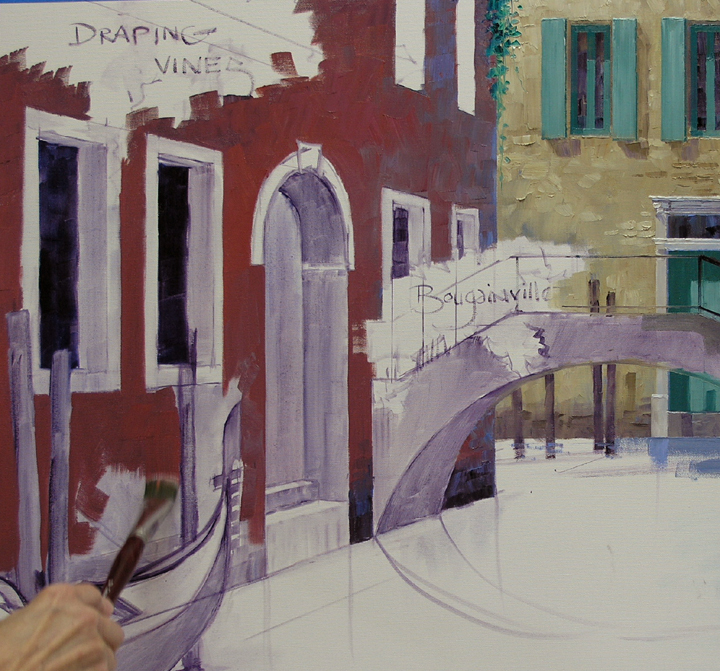 I use a thin oil wash of MUD (Ultramarine Blue + Alizarin Crimson) + a lot of Liguin. 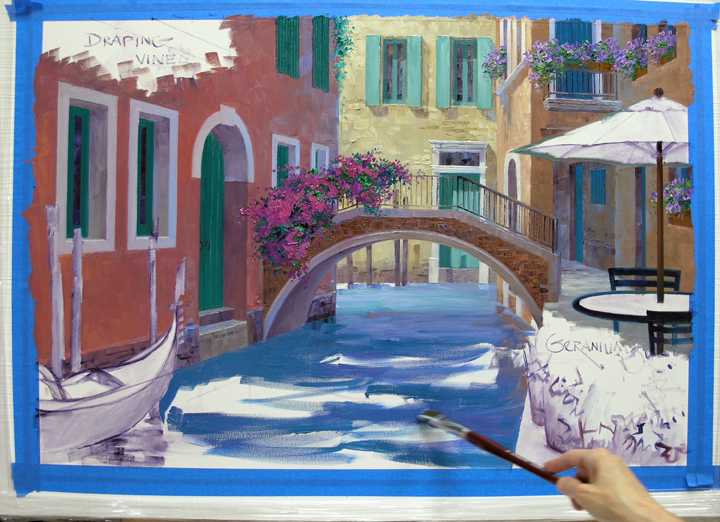 We prime the canvas with white acrylic which makes the surface a tiny bit slicker than a coat of gesso. It’s a lot easier to wipe off lines and make corrections. The open sidewalk to the right of the canal just seemed to be a perfect place for an outdoor cafe. 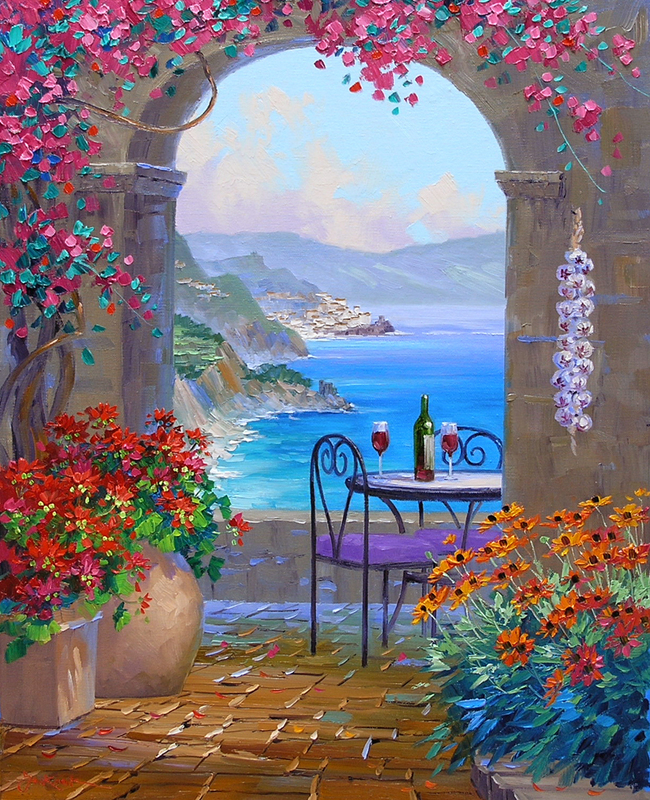 Flower pots, table, chairs and umbrella make a spot to sit and enjoy the view. 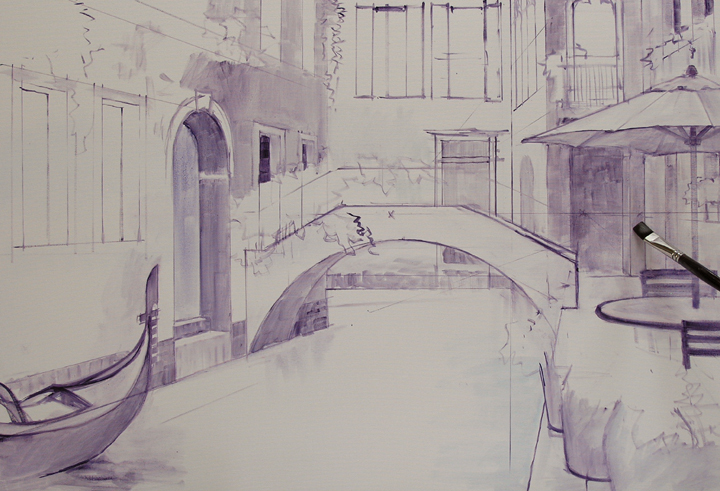 After drawing in the gondola moored on the opposite side of the canal work continues on the buildings.